The Museum is very excited to have acquired its first example of St Agnes potter Annette Bulkley’s work, thanks to Tom Thompson’s purchase of this little vase on eBay. The Bulkley sisters, Annette (b.1868) and Helen (b.1870), had moved permanently to St Agnes in about 1922, making pottery and founding their studio at Wayside, which continued until at least 1937. The Museum has several examples of Helen’s work, in its characteristic chunky style and vibrant turquoise colour (obtained from local copper which she sought out herself) but had no examples of Annette’s work until now. Possibly her output was less as she became very involved in caring for the countryside around St Agnes. She was a Committee Member of the St Agnes Countryside Protection and the Old Cornwall Society, and in 1934 was one of the honorary secretaries when the Council for the Preservation of Rural England fought to prevent housing being built on open spaces nearby, including at the iconic St Agnes Head. 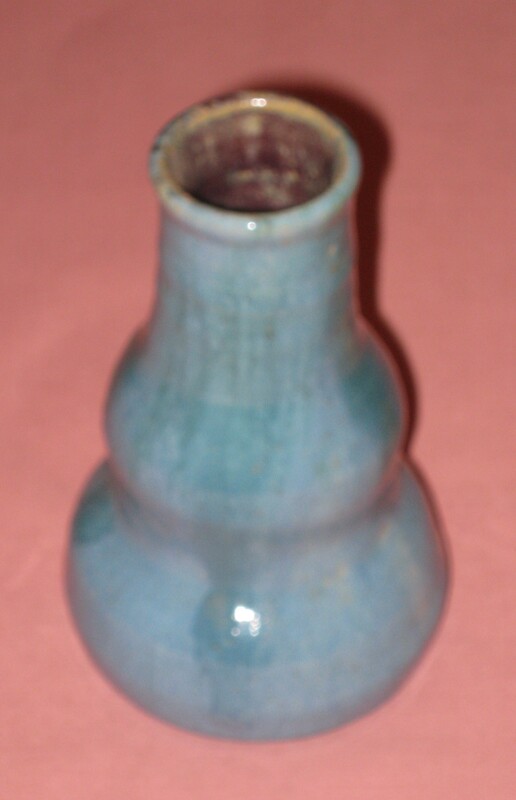 Annette’s vase shares the same turquoise lustre as seen in her sister’s work but is finer and more delicate. Annette died in 1944 and Helen in 1955. They gave Wayside and their two cottages to the National Trust who continues to own them to this day.